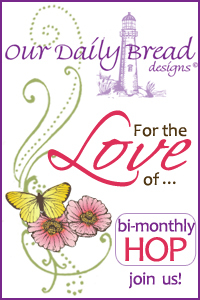 Welcome to the Our Daily Bread Designs Alumni Team bi-monthly hop, this weeks hop theme is For the Love of Crosses! I used Our Daily Bread Designs Never Give Up stamp set to create my card, pairing with the grunge papers from KaiserCrafts 75 Cents pattern paper line. I stamped the Grunge Cross image from the set onto a piece of pattern paper, stamped the image a second time, cut it out and popped it up over the first image. You'll want to be sure to visit and comment on all the participating designers blogs, because one of them is a hop hot spot and a name will be drawn from that blogs comments to win a $15 ODBD gift certificate towards stamps. You have until Wednesday, April 10th at 6PM EDT to leave comments. What a beautiful card Lisa! I just love the grunge feel and the blue! Oh I love this this cross! Those colors and the grungy effect is amazing! Love this color combo and the dimension you achieved by popping the cross up. Have a blessed Easter!! Striking and center stage--just as the cross should be. I love the colors of this card. This cross is one of my favorites. This card is stunning. So beautiful with a rustic feel. Very nice. Gorgeous card Lisa! Somehow I don't associate grunge with gorgeous, but you have pulled it off :) Love the layers and that cross is so beautiful! wonderful design! Beautiful card! Thanks for sharing. This is my first time doing a hop for ODBD! All I can say is WOW! It just leaves me speechless. Wow how stunning. Love the choice of how you layered. thanks for sharing your Inspirational card. The design layout works perfectly with this gorgeous stamp. Thank you sharing this gorgeous card! Love the colors! Wow Lisa...what an awesome card...I so love this grunge cross...and I love how you displayed it against that awesome DSP!! 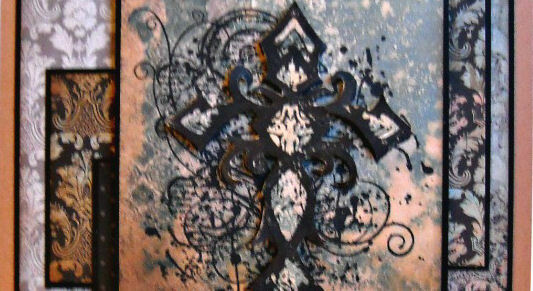 Awesome grunge cross! I love the rich colors you chose to go with the stamp. I love the shadowy look of the cross. It is so unique and I love it! This cross is so beautifully designed but requires a sold backdrop - which you so beautifully provided! The dimensions and colors are dramatic without taking away from the message of the cross. Thank you! Beautiful card. Love the way you did the cross image. I love this stamp, and you have set it off so nicely with layers, dimension and beautiful papers. Have a blessed resurrection celebration! Like how you popped the cross, and these papers look like they were made just for this stamp, perfect! Lisa this is soooo gorgeous! This is one of my favorite cross stamps an I love the papers you used, how you popped up the cross, and the colors of the papers really blend beautifully! Beautiful card. I love this cross. Totally awesome card Lisa! The cross is so cool :) !!! I know this sounds mean.,but don't take it personal...I have never been a fan of grunge! To me it just always looks like confused and ugly!! I am gonna hate myself with this post because I love your work normally, but have to be honest! This is a gorgeous creation! I love the grunge look! Beautiful card! I love the grunge effect. Thanks for sharing. Very pretty grunge card! Thanks for sharing with us. Such a beautiful and moving card! Thank you. Gorgeous! I love the grunge cross stamp! Love your color choices! Have a blessed Easter! I REALLY like this cross. Beautiful!! THUD! Gorgeous! I just love the layers and how you used the Grunge Cross on your card Lisa...What a striking Easter card! Hope you have a wonderful Easter! Hugs! Beautifully coordinated card...I have this set and must begin using it...just the inspiration I needed!!! !